Small Group Instruction: teacher meets with small groups for guided practice, conferencing, informal assessment, etc. Many teachers plan a weekly game day, using stations and rotating activities to best meet the varied needs of learners in their classrooms. One station is often the teacher, who is able to meet with small groups of students for remediation, enrichment, a quick assessment or to present problem-solving activities. This weekly session benefits all students who are actively involved playing games while the teacher meets with small groups. By carefully planning both the small groups and the rotation through activities, teachers may easily differentiate activities to provide additional practice or enrichment for students who have mastered the week's concepts and skills. Students enjoy being in control of their learning for the day and remain engaged throughout the allotted time. 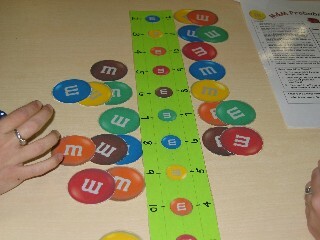 Students practice addition facts in the M&M game as they also learn firsthand about probability. There are many facts with the same sum. In this game, students quickly learn which sums they are more likely to toss in this two-dice game. Students are mastering basic facts and strategizing to produce the best outcome. It's a winning combination! Problem Solving: students work independently or in pairs on open-ended problems. They may peer edit responses as well. The end of the year is a great time to try out this practice, if it is not a regular feature of your classroom. Package the games and materials for easy retrieval by students and use a whiteboard to create the rotation schedule and groups for the day. Quickly run through the activities and your expectations for student performance, then set the timer and let the groups get started. Use the time to meet with small groups you have identified as needing reteaching, guided practice or enrichment. Have students meet with you around a table, if possible, so it is easy for you to monitor individual student's work. Use team planning time to coordinate with your grade-level partners. This is an effective way to plan for this differentiated instruction and to maximize preparation time. Share the planning; share the wealth! A simple Game Day Group/Center Chart can be created on a whiteboard [see picture to left] using color-coding and pocket group charts to organize students and free up the teacher to work uninterrupted with small groups of students. Teachers often use a timer to signal a clean-up time of 1-2 minutes before groups move to the next center or station. Game Day Center/Group Chart lets students know with whom they'll be working and which centers they'll visit. Students always enjoy "playing games" in math class, feeling that they're getting away without working. Introduce games for practice of math facts, and then move them to the Math Game Center. Encourage students to play the games during transitional times, when work is done early or during indoor recess times. These activities are perfect end-of-the-year activities as they accommodate the changing schedules and absent students that characterize these closing weeks of school. See Mathwire Mathematical Games for a list of games by NCTM standards. All Mathwire games are available in PDF format for easy browsing and downloading. Enjoy! These games help students use a variety of skills and strategies to successfully play and win the games. Students who are fluent in their basic facts have a distinct advantage. Having students play in pairs increases mathematical thinking, strategizing and discussion. Add these games to your math center area and encourage students to play them when they are finished work or on Game Days. These games are an excellent resource for those end-of-the-year transitional times between assemblies, field days, etc. Contig: Play the Contig Game to practice addition, subtraction, multiplication and division. Students mentally try out many different combinations in search of the best move. 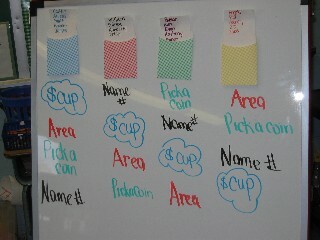 Pig/Skunk: Students will get plenty of practice mentally adding a long list of single digit numbers, as they play Pig. Students will use a variety of methods to find their score and calculators can be used as an accommodation for younger students. Older students may graduate to the game of Skunk where they will also have to use a working knowledge of probability to win the game. 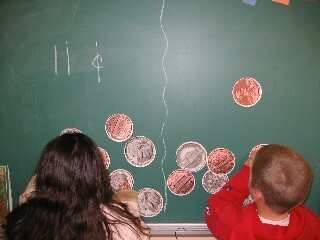 Clean Up the Money: Students will also practice coordinate graphing skills as they play Clean Up the Money and try to win the most money. See Searching the Mathwire.com Site for a more thorough explanation of these search options along with pictures to explain how to navigate around the site.